A formal brocade rakusu with ring. 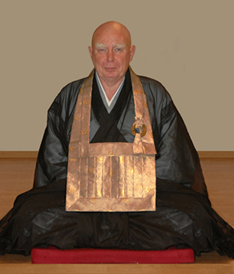 A plain practice rakusu with ring. A collection of rakusus with rings. Freshly chainsaw cut spalted birch, Sedgwick, Maine. End grain view, spalted birch, Sedgwick. Dry, planed, spalted maple board from Dennistown, Maine is laid out using a transparent Pringles® chips container-lid/template. The template enables the visualization and selection of the figuring in the final ring. Soft, punky areas can be predetermined and avoided. The spalted maple shown is a donation from the Alder Brook Company of Dennistown, Maine. Alder Brook is a small family owned business in the Mountains of Western Maine. They search for, collect, saw and process the finest Spalted Maple Lumber, Burl Wood, and Birch Bark & Birch Fireplace Logs. The transparent Pringles® chips container-lid/template used to lay out cuts on a spalted maple board from Minnesota. The center points are drilled with a center drill in a 3/8" hand drill. The OD [Outside Diameter] is then established with a 2 7/8" hole saw. The board is not cut completely through, leaving enough material to enable the removal of the ID [Inside Diameter] slug. When the ID cut is solidly established, the 1/4" pilot hole is extended through the board. The board is then flipped over and a minimal establishing cut is taken with the OD saw indexing on the pilot hole. The board is again flipped. The 1 3/8" ID saw cuts completely through the board and the ID slug is removed. The OD cuts are then completed resulting in a ring plug. Effort is applied to minimizing waste. A rasp is applied to remove any heavy burr or flashing. Ring plugs are deburred, smoothed somewhat, and inspected. A starting face is established on the plug with the belt sander. Ring plugs are marked for slicing, with the established starting face on a flat, the plug is rotated around a marking pen held on a 1/4" spacer. The slices are made using a vise and a hacksaw. The layout line is followed carefully completely around the plug. Breakthrough yields a rough ring blank. The breakthrough cut produces a rough blank (one side pre-finished, one side rough) and a rough plug. The rough blank is finished on the sander yielding a ring blank, the rough plug is then given a new first face on the belt sander and the process repeated. 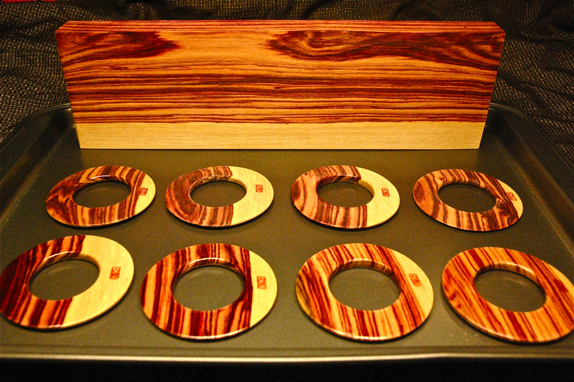 A box of spalted malpe ring blanks. Spalted malpe and birch ring blanks ready for foiling..
End grain blanks are polymerized, often numerous times, to increase strength for sanding. Some straight grain blanks need polymer in soft areas. Ploymer is applied to the point that any soft area is comletely permeated. A rough foiling fixture set up on a small bench-mount Ryobi® belt/disk sander. The fixture consists of a machinist's vise, a "C" clamp, two 1/2" ID bronze bushings, a 1/2-13 x 5 1/4" hex bolt, two step washers, a 1/2" ID stock compression spring (shortened to fit) and two half height 1/2-13 nuts. A speed wrench with a 3/4" socket is used to drive and control the abrasive cuts. The rough foiling fixture is set for a 9º angle of attack with a 2º clearance offset. The Fixtured ring blank is rotated counterclockwise and gently fed into the moving belt with the speed wrench. When the marked centerline of the blank is approached, the blank is flipped over and the second side completed. Bench mounted hand ring sanding jig comprised of a drill press vise, 1.357 OD chassis punch die and two clamps. Ring sanding jig with myrtle foiled blank mounted to the mandrel. Ring sanding jig with maple foiled blank - side view. Ring sanding jig with spalted maple foiled blank. Spalted maple foiled blank finished with 100 grit paper. Sanding and coating photos to be added here. Spalted maple foiled blank ID edges radiused on router. Spalted maple foiled blanks radiused. Myrtle finished foiled blank signed with chop. Myrtle finished blank with chop. Myrtle  pre-coated ring and a finished ring. Preparing 1000 grit paper for sanding. Finish sanding with 1000 grit paper. Final sanding, 1500 grit paper. A finished batch. Clockwise from left top, birch, end grain birch, birch branch slice, end grain birch, poplar root, maple, maple, maple. The first ring out of a batch of spalted Maple from the Alder Brook Company of Dennistown, ME. A batch of finished rings shines in the light from the door. From time to time, flat surface rings are coated with EnviroTex Lite®. EnviroTex Lite® is water clear reactive polymer compound. It cures to a thick, glossy coating in about 8 hours at 70°F, and reaches full strength and toughness in about 72 hours. Above is a photograph of the curing process carried out under vacuum (to de-gas the polymer). The ring is left on the vacuum table under cover for 24 hours. 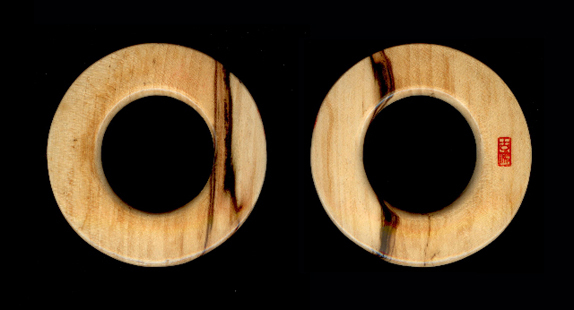 Here, is a large, special purpose ring made from a slice of Aquilaria wood. The wood is Aquilaria crassna from Nui Dai, a mountain in Southern Vietnam (called the 7 Mountains Area) near the Cambodian border. Aquilaria species serve as the host for various fungi that induce the tree to produce resinous defense compounds that are highly aromatic and have been treasured for millennia. The resinous wood produced by the infection is known as Agarwood, Oud, and Jinko (among other names). This wood serves as the base for the finest top end incense in the world. The piece being coated in the above picture exhibits a black band around the ID. This is the resin bearing material. The Aquilaria wood is a gift from my friend, Professor Robert A. Blanchette of The University of Minnesota. Dr. Blanchette is a plant pathologist whose major interests are in the area of forest pathology and wood microbiology with research in tree defense mechanisms, deterioration processes of wood, biotechnological uses of forest fungi, biological control of forest pathogens, and the conservation of archaeological wood and wood of historic value. 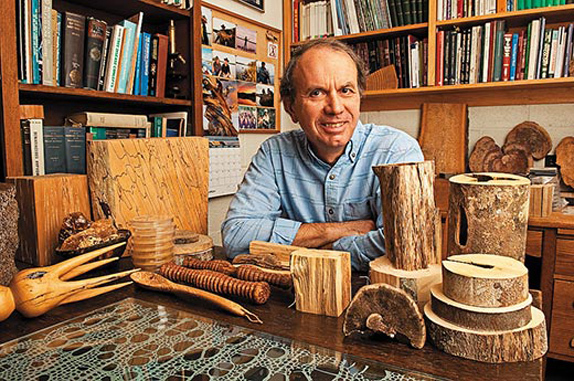 His research projects involve novel, interdisciplinary approaches to solving tree disease problems and understanding the biology and ecology of forest microbes. An Aquilaria Crassna trunk slice display made for Dr. Blanchette in appreciation. 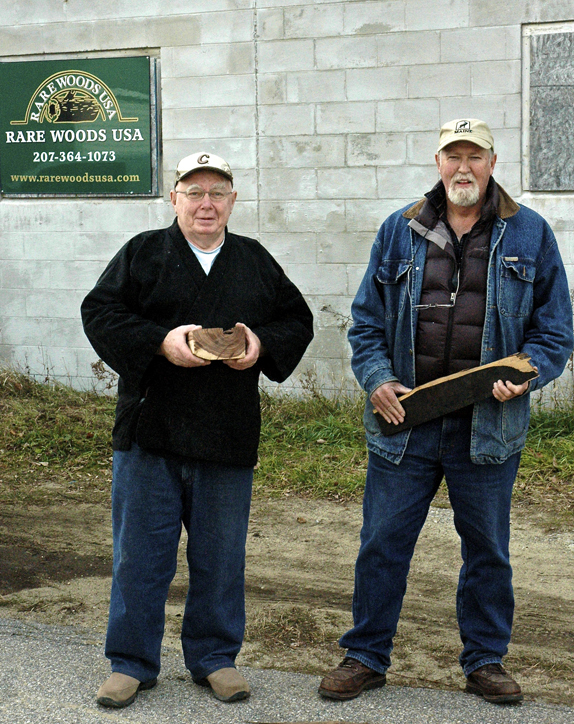 The home of the widest range of Rare and Exotic Timbers in the USA! First established in South Africa 30 years ago - now located in Mexico, Maine. Mexico, Maine - November 15, 2012. His contributon is noted and duly praised! The rings are given away to Zen teachers and practitioners. Each ring takes about four to five hours to manufacture. Rakusus (for a fee) - contact for details.